Given the sheer amount of diversity between cruise lines and resorts, it’s tough to make a blanket statement about this. In general, the food quality is in line with the price for both cruises and resorts so you're going to get what you pay for. Still, cruise lines have been upping their game across the board with specialty restaurants (Norwegian Breakaway has 27) and celebrity chefs like Jamie Oliver (below), Jose Garces, Guy Fieri, Devin Alexander, and Curtis Stone. Our Pick: Cruises. The variety of choices you’ll have on newer ships is astounding, and that’s without taking into account the selections in all the ports you’ll visit. On a Caribbean cruise, you’ll be able to visit some of the most beautiful beaches in the world. Southern Caribbean itineraries in particular are known for the famous beaches of Aruba, Curacao and Barbados. 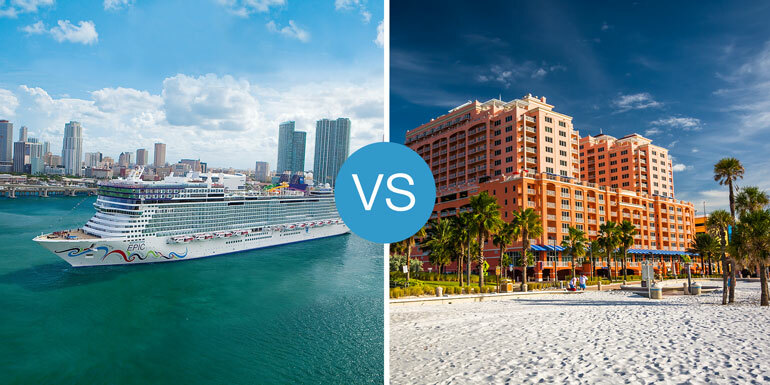 However, since cruises ships only have a limited time in port, beach enthusiasts who plan on spending nearly every free moment of their vacation camped out in the sand will find it easier to do so in a resort. Our Pick: Draw. Cruises win out for variety, but resorts have easier accessibility. Cruise ship pools tend to be small and, on sea days, they can be crowded. Resorts that have large enough pools to accommodate their guests win this category hands down based on size alone — and that’s before you factor in the time element. Our Pick: Resorts. Cruise ships can boast impressive water parks and slides, but the crowds can be a bit overwhelming. Most cruises offer a wide variety of activities throughout the day and evening, catering to a range of tastes with plenty of options. Active travelers can sail on ships with rock walls, ziplines, and basketball courts, while the intellectually curious can book a trip with an impressive list of learning opportunities like cooking classes or guest speakers. Even resorts that pride themselves on activities fall short of the range available at sea. Our Pick: Cruises. This one is a no brainer. Not only do cruises have more activities on the ship than the average resort, but you’ll easily be able to explore several different ports during your cruise. Because cruise ships have limited space, it’s safe to say that in general, resort rooms are larger than cruise ship cabins — with larger bathrooms, too — and have more features and amenities. On the other hand, cruise ships tend to have a better variety of rooms to choose from, and some cruise ship suites are just as fancy and spacious as their counterparts on land. Our Pick: Resorts. It’s not a big win, but the extra elbow room has to count for something. People who look forward to massages, facials, and other treatments can usually get them at most major resorts and on all mainstream cruises. The difference is that cruise ship spas are typically larger and have more amenities — saunas, steam rooms, and, in some cases, Turkish baths and heated lounge chairs — than your average resorts that don’t claim to be destination spas. Our Pick: Cruises. These spas are the real deal. Cruise lines go to great lengths to attract families using a wide variety of amenities. Children’s programs are offered for every possible age group, and convenient babysitting services mean Mom and Dad can have alone time whenever they need it. Plus, several cruise lines will let kids cruise for free or discounted rates. Resorts will often have some sort of organized children’s activities, but they can’t match costume parties with Spongebob, Mickey, or Shrek. Our Pick: Cruises. No matter how old your children are or what they're into, there is a perfect line for them. Our Pick: Cruises! Ok, so we’re a bit biased. But that’s only because we truly believe that cruises are a superior vacation. Resorts may a have a slight space advantage, but cruises win handily when it comes to the sheer variety of food, activities, and entertainment. And when you add in the chance to visit several different cities without having to deal with the headache of transportation, it doesn’t seem like much of a contest, does it? What do you like about cruise ships over resorts? I prefer cruises in that I get to visit more places than at a resort. We prefer cruises with our kids because we can give them more freedom on the ship without worrying about them. We think the ship is a much safer and kid friendly environment than any resort.